Anthony Woodburn deals in fine antique clocks - 17th & 18th century English antique bracket clocks, longcase clocks and antique barometers, including pieces by DANIEL QUARE, London . 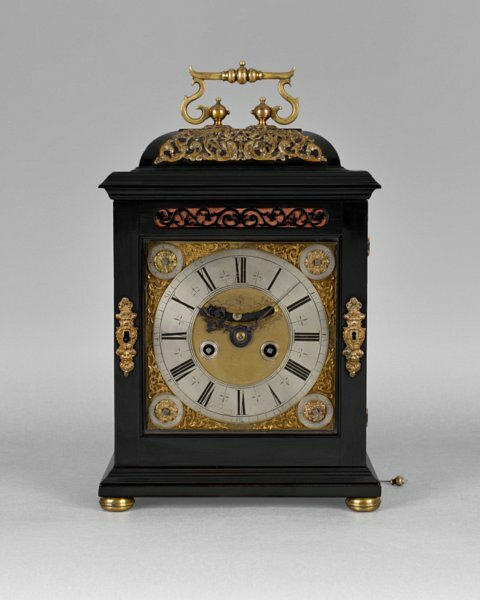 An important William and Mary quarter repeating spring table clock in a case veneered in ebony with gilt brass mounts. The domed caddy case stands on turned bun feet and has matching mask head escutcheons to either side of the door with sound fret above. The domed ebony top has a single elaborately foliate scrolled mount around two grotesque heads. The caddy supports a single carrying handle in a typical manner of Quare. The gilt brass dial is mounted with four corner subsidiary dials for rise and fall regulation, strike/silent option and the lower two for pendulum lock. The spandrels which flank the subsidiary dials and the main chapter ring are of a foliate design. The chapter ring is signed D Quare London. The silvered chapter ring has roman numerals with outer Arabic minutes. The centre is finely matted with a broad false pendulum aperture and silvered ringed winding holes. The steel pointers are finely pierced and faceted. The eight-day duration movement has quarter repeat mechanism with the hours sounded on a single bell and the quarters on two smaller bells. The escapement is verge. The back plate is delicately engraved with foliage and serpents around a polished oval signed by the maker Daniel Quare London. Daniel Quare was a worthy contemporary of Thomas Tompion. Born in 1647 he was admitted as a Brother of the Clockmakers’ Company in 1671 and served as Master in 1708. Towards the latter part of his career he went into partnership with Stephen Horseman who had been apprenticed to him. When Daniel Quare died in 1724, Horseman carried on the business until 1733.